Spacious 3BR/2BA/1Car Garage with double oversized parking pad/driveway home in lovely Mill Pond neighborhood! This freshly painted home is perfect for your growing family or retired life. This is a fantastic home for entertaining! There are 3 large bedrooms with newer plush carpeting, newer ceiling fans, new vinyl windows and plenty of closet space. The master bath has been updated with new vanity, shower and fixtures. The kitchen has all custom wood cabinets, stainless steel appliances that is open and overlooks a gorgeous backyard and an awesome Tiki Hut, newly refinished wood deck, tropical landscaping and vinyl privacy fencing around the perimeter of the yard. There is plenty of room for entertaining. The garage has new painted flooring. 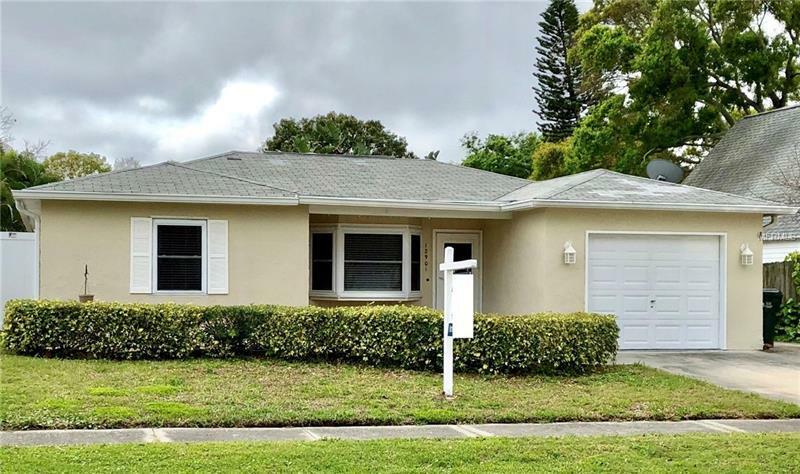 This desirable Largo neighborhood offers easy access to the Largo Rec Center, Publix shopping center, and top-rated public schools in just minutes! Best of all this is NOT a flood zone and you’re just a 6 minute drive to the BEACH. Whether it’s your first home or your forever house this is the perfect place to call home.